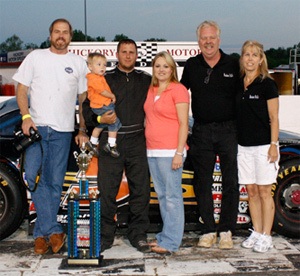 ( Newton, NC - - April 17, 2010 ) It was a beautiful night for racing as the stars of Hickory Motor Speedway's NASCAR Whelen All-American Series hit the famous 3/8 mile for Hickory Daily Record Night at the Races. The night included appearances by the Bojangles Late Models, the Advance Auto Parts Limiteds, the Hickory Street Stocks, the Red Baron Race Parts Hobby Stocks and a special appearance by the Ford Focus Midgets. It was a spectacular night for the No. 88 of Bojangles Late Model driver, Kyle Mansch as he found his way to Victory Lane after putting his ride on the pole for the evening's feature event. The Bojangles Late Models kept fans on the edge of their seats as they hit the asphalt for the 50 lap feature event of the evening. The night started out on the right foot for the No. 88 of Kyle Mansch, as he found himself on the pole for the second time of the 2010 racing season. Mansch inched away from the field after the green flag waved, as the No. 5 of Dexter Canipe Jr. made his way into the fourth place position on lap two after earning a fifth place starting position. The first caution of the feature fell early after the No. 19 of Kyle Moon spun out on lap three as he entered turn three. Ten laps into the feature the No. 43 of Jesse LeFevers began to put pressure on the No. 92 of Candace Muzny as he looked for an opportunity to take over the fourth place position. Muzny held a strong line as LeFevers slowly fell off the pace. Allowing the No. 51 of Josh Wimbish to move passed LeFevers working his way into the top five, while Muzny held onto the fourth place position. A second caution was brought on lap 29 by officials, due to debris on the track. On lap 35, Wimbish pulled under Muzny looking to move into the fourth place spot. Wimbish was able to complete the pass and settle safely into the position on lap 36. With ten laps remaining the No. 6 of Michael Cherry pulled under LeFevers, beginning the battle for sixth. Cherry nosed head of LeFevers several times, but LeFevers held strong bringing home a sixth place finish. 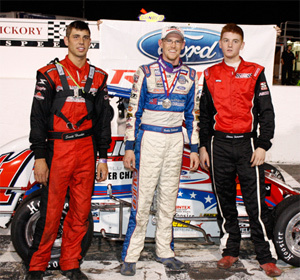 Mansch maintained his strong run throughout the night as he led the field to the checkers. Mercer, Canipe Jr., Muzny and Wimbish rounded out the top five. The Advance Auto Parts Limiteds put on an exciting show as the No. 97 of pole sitter and rookie Brandon Lynn lead the field to the green for their 35 lap race. The No. 5 of Dexter Canipe Jr. jumped into the lead on the first lap from his second place starting spot, leaving Lynn to ride around in second. As the field made their way into turn four the No. 12 of Austin McDaniel got into the back of the No. 11 of Matt Peircy, causing both to lose momentum, allowing the No. 07 of Tyler Church and No. 28 of Sammy Jasper to move to the front of the field. The first caution fell on lap three after McDaniel spun around heading into turn four. Canipe Jr. pulled away from the field at the restart, while the Church managed to maneuver his by way Lynn taking over the second place position. The second caution of the race fell on lap seven after the No. 14 of Brandon Cox and the No. 8 of Justin Sorrow made contact in turn one, sending Cox hard into the outside wall. The third caution would soon follow after Jasper and the No. 6 of Brandon Hudnall collided as they headed into turn two on lap nine. The No. 69 of Trevor Hignutt fell victim to the wreck, receiving minor damage to his ride. A tight battle for second continued between Church and Lynn, as Lynn slid passed Church to regain the position on lap 11. A fourth caution came out on lap 14 after the No. 66 of Travis Byrd and the No. 72 of Brad Eddy connected coming out of turn one. Church didn't waste any time getting by Lynn, as the battle for second continued. Lynn proved just how strong of a car he had after he regained the coveted spot on lap 16. The fifth caution of the race was brought out on lap 18 for debris on the track. The sixth and final caution came out during the restart after the No. 15 of Sheflon Clay cut a tire as the field headed down the backstretch, pushing the No. 44 of David Parks up into the outside wall, bringing both of their nights to an early end. Canipe Jr. and Lynn pulled away from the field after the final restart. Lynn began to gain ground on Canipe Jr. during the final five laps, but time ran short as Canipe Jr. took the checkers leaving Lynn to settle for second. The No. 8 of Mark McIntosh, Church and McDaniels rounded out the top five. 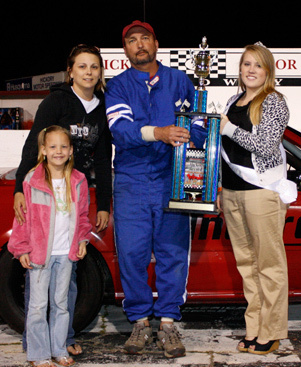 The Hickory Street Stocks started the night off right as they completed their 30 lap event completely caution free. The No. 21 of pole sitter Roger Pitts put on a clinic as he led the field around the track, maintaining the lead for the duration of the race. It wasn't the night that No. 25 of Jeremy Pelfrey was looking for as he slowly fell back positions during the race. The No. 1 of Taylor Stricklin was able to grab second from Pelfrey by lap two. The No. 03 of Kevin Eby followed Stricklin's lead, moving into the third place position from Pelfrey on lap nine, and the No. 64 of Marshall Sutton sailed by Pelfrey on lap 12 grabbing fourth. During the final laps Eby had reeled in Stricklin, as he looked to move into the second place position. Time ran short for Eby causing him to settle for a third place position. Sutton and Plefry completed the top five. The Ford Focus Midgets made a special appearance during Hickory Daily Record Night at the Races, putting on a fast paced show for the fans. The 13 car field was smooth sailing during the first laps as they cruised around the historic short track. The No. 96 of Steve Intravaia quickly took the lead from the No. 14 of pole sitter Scott Hunter. Intravaia was on a roll, until lap 23 when the No. 11 of Brad Riethmeyer grabbed the lead as the field headed out of turn four. The first and only caution of the feature waved on lap 33 after the No. 2 of Cody Acton and the No. 55 of Nick Drake made contact in turn two. Two laps remained as the field came to the restart. Riethmeyer lead the field to the checkers leaving Intravia, Hunter, the No. 97 of Justin Hommel and the No. 19L of Brad Noffsinger to round out the top five. 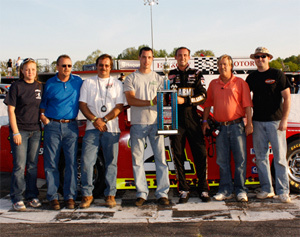 The Red Baron Race Parts Hobby Stocks rounded out the festivities for Hickory Daily Record Night at the Races, as they took to the track for their 20 lap event. The No. 85 of Jeff Weisner led the field to the green and brought them to the checkers. It was a game of follow the leader until the No. 88 of Andrew Towery passed the No. 12 of Jeremy Whitman on the outside line on lap 17. Weisner, Towery, Whitman, the No. 28 of Casey Pierce and the No. 31 of Steve Wills completed the top five. 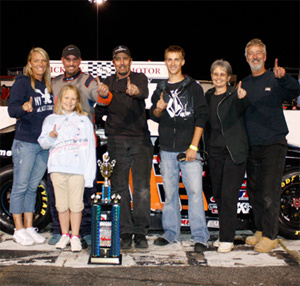 Join us Saturday, April 24 th for Everett Chevrolet Night at the Races featuring the NASCAR Whelen All-American Series. The night will include appearances by the Advance Auto Parts Limiteds, the Everything Attachment Super Trucks, the Hickory Street Stocks, the Hickory 4-Cylinders and a special 100 lap feature for the Bojangles Late Models. Grandstands open at 5PM with qualifying immediately following. An On Track Autograph Session will take place at 6PM and feature racing begins at 7PM. Tickets are only $10 for adults, $8 for teens and seniors, $5 for kids ages 7-12, with kids ages 6 and under FREE! Family passes are available for $25 and include two adult tickets and tickets for all kids 12 and under.